Carolina Barbecue in Northeast Ohio? When I think of northeast Ohio, my first thought is not, “the Carolina BBQ capital of the rust belt.” Rather, it is, “there’s a northeast Ohio?” Indeed, apparently there is a northeast Ohio and it may very well be the Carolina BBQ capital of the rust belt. The Old Carolina Barbecue Company has four locations in northeast Ohio–Akron, Canton (2), Massillon–and a fifth location is set to open soon. I have frequently wondered about the lack of Carolina-style barbecue joints across the country compared to places serving brisket, ribs and the like. Thus, it is particularly amazing that a restaurant in a part of the country known primarily for Goodyear tires and the Pro Football Hall of Fame would be a hotbed for Carolina barbecue. The owners of the Old Carolina Barbecue Company seems serious about their commitment to Carolina traditions. According to their website, “Traveling across the country opened our eyes to a great style of food not widely represented in our home state. While Texas, Kansas City and Memphis all have their own claim to the best barbecue, it was the “True Q” of the Carolinas that we appreciated the most.” Old Carolina claims to cook their ‘cue “over hickory wood” (presumably on an electronic cooker with hickory added, but I’ll check into that). They say they also serve brisket and chicken, “to keep the yankees happy,” but their focus is pork. The pork is served unadorned with sauce, a good sign for a BBQ restaurant, and comes with five sauce choices for seasoning at the table. While NC BBQ fundamentalists (and I am one in most cases) would shudder at the thought of serving more than one sauce, this is Ohio so I recognize it is probably a wise business decision. Vinegar and hot pepper aren’t for everyone. Put another way, not everyone is sophisticated enough to appreciate the vinegar and hot pepper aesthetic. Among the sauces offered are variations on Lexington- and Eastern-style sauces, as well as South Carolina mustard-based sauce and a couple of sauces that pander to non-Carolinians. The rest of Old Carolina’s menu is pretty typical for a BBQ joint inside or outside of the Carolinas, except that it serves brisket, chicken, ribs, and turkey as well as “pulled pork.” Sides include hush puppies, Brunswick stew, slaw (creamy mayo and vinegar variations offered, notably), french fries and more. Banana pudding is offered for dessert, and sweet tea is available alongside yankee tea. Did I mention they offer Cheerwine too? Huzzah! If I ever make it to northeast Ohio, I will definitely check this place out. Honestly, I fear that it aspires to be the next Dickey’s, given that franchise opportunities available and they have a virtual stack of slick marketing materials online, but I am holding out hope that it is simply a humble business with an appreciation for Carolina barbecue. Until I make it to the greater Akron/Canton area (a destination that wasn’t previously on my bucket list), I’ll have to rely on reports from loyal readers. I will also be in touch with the owners to see if they are available for a BBQ&A… stay tuned. Awesome. My folks live in that area, so I will DEFINITELY give you a full report the next time I head that way. Great, do let me know what you find. You’re probably not that far off with your Dickey’s comment. Having said that, Ohio has no real barbecue tradition, so what is expected in this vicinity is nothing more than grilled or crock pot meat with some vague, sweet sauce. I’ve tried Old Carolina, (the Akron/Fairlawn location), and it’s a good alternative if you’re craving NC style and stuck in Northeast Ohio. Unfortunately, they have to give to the lack of sophistication of the average Ohioan. Not their fault, that is just how it is around here. The sauces are good, (I have two bottles in my fridge), but IMHO, it’s more geared for Northern tastes. But offering full disclosure, those two bottles are sitting next to my homemade Eastern NC sauce, a bottle of Num Num sauce and the last of the Sweatman’s sauce I managed to swindle on my last trip to SC. So, I may be just a little biased! Porky, did you ever get a reply to your inquiry about a BBQ&A? Another place worth talking to might be Brother Jimmy’s in NYC. It started out with a Duke/UNC connection. Just checked out their website. 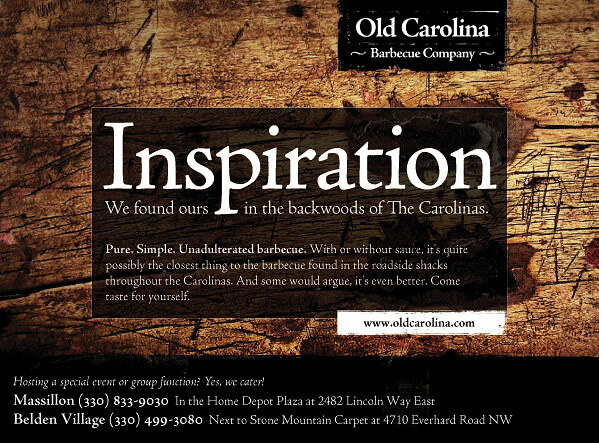 Their saying that they serve a product “just like the barbecue found at road-side shacks throughout the Carolinas” gives me pause. I’ve never eaten barbecue from a shack in the Carolinas — never even seen a barbecue-serving shack here. Maybe 75 years ago. Maybe still in Alabama and Mississippi. But not here. Still, their hearts seem to be in the right place, and I wish them well.